I need to monitor NAT and PAT. Can someone help me? Shows NAT statistics, including hits for each NAT rule. Shows NAT pool statistics, including the addresses and ports allocated, and how many times they were allocated. Shows current NAT session information. This section describes how to configure network object NAT for dynamic PAT (hide). For more information, see the “Dynamic PAT” section. If available, the real source port number is used for the mapped port. However, if the real port is not available, by default the mapped ports are chosen from the same range of ports as the real port number: 0 to 511, 512 to 1023, and 1024 to 65535. Therefore, ports below 1024 have only a small PAT pool that can be used. (8.4(3) and later, not including 8.5(1) or 8.6(1)) If you have a lot of traffic that uses the lower port ranges, you can now specify a flat range of ports to be used instead of the three unequal-sized tiers: either 1024 to 65535, or 1 to 65535. If you use the same PAT pool object in two separate rules, then be sure to specify the same options for each rule. For example, if one rule specifies extended PAT and a flat range, then the other rule must also specify extended PAT and a flat range. Many application inspections do not support extended PAT. See the “Default Settings and NAT Limitations” section in “Getting Started with Application Layer Protocol Inspection,” for a complete list of unsupported inspections. If you enable extended PAT for a dynamic PAT rule, then you cannot also use an address in the PAT pool as the PAT address in a separate static NAT-with-port-translation rule. For example, if the PAT pool includes 10.1.1.1, then you cannot create a static NAT-with-port-translation rule using 10.1.1.1 as the PAT address. If you use a PAT pool and specify an interface for fallback, you cannot specify extended PAT. For VoIP deployments that use ICE or TURN, do not use extended PAT. ICE and TURN rely on the PAT binding to be the same for all destinations. If a host has an existing connection, then subsequent connections from that host will use the same PAT IP address if ports are available. Note : This “stickiness” does not survive a failover. If the ASA fails over, then subsequent connections from a host may not use the initial IP address. Round robin, especially when combined with extended PAT, can consume a large amount of memory. Because NAT pools are created for every mapped protocol/IP address/port range, round robin results in a large number of concurrent NAT pools, which use memory. Extended PAT results in an even larger number of concurrent NAT pools. (Optional) Create a network object or group for the mapped addresses. See the “Adding Network Objects for Mapped Addresses” section. Configures a network object for which you want to configure NAT, or enters object network configuration mode for an existing network object. If you are creating a new network object, defines the real IP address(es) (either IPv4 or IPv6) that you want to translate. Configures dynamic PAT for the object IP addresses. You can only define a single NAT rule for a given object. See the “Additional Guidelines” section. Interfaces—(Required for transparent mode) Specify the real and mapped interfaces. Be sure to include the parentheses in your command. In routed mode, if you do not specify the real and mapped interfaces, all interfaces are used; you can also specify the keyword any for one or both of the interfaces. – An inline host address. – An existing network object that is defined as a host address (see Step 1). – pat-pool —An existing network object or group that contains multiple addresses. – interface —(Routed mode only) The IP address of the mapped interface is used as the mapped address. If you specify ipv6 , then the IPv6 address of the interface is used. For this option, you must configure a specific interface for the mapped_ifc . You must use this keyword when you want to use the interface IP address; you cannot enter it inline or as an object. – Round robin—The round-robin keyword enables round-robin address allocation for a PAT pool. Without round robin, by default all ports for a PAT address will be allocated before the next PAT address is used. The round-robin method assigns an address/port from each PAT address in the pool before returning to use the first address again, and then the second address, and so on. – Extended PAT—The extended keyword enables extended PAT. Extended PAT uses 65535 ports per service , as opposed to per IP address, by including the destination address and port in the translation information. Normally, the destination port and address are not considered when creating PAT translations, so you are limited to 65535 ports per PAT address. For example, with extended PAT, you can create a translation of 10.1.1.1:1027 when going to 192.168.1.7:23 as well as a translation of 10.1.1.1:1027 when going to 192.168.1.7:80. – Flat range—The flat keyword enables use of the entire 1024 to 65535 port range when allocating ports. When choosing the mapped port number for a translation, the ASA uses the real source port number if it is available. However, without this option, if the real port is not available, by default the mapped ports are chosen from the same range of ports as the real port number: 1 to 511, 512 to 1023, and 1024 to 65535. To avoid running out of ports at the low ranges, configure this setting. To use the entire range of 1 to 65535, also specify the include-reserve keyword. Interface PAT fallback—(Optional) The interface keyword enables interface PAT fallback when entered after a primary PAT address. After the primary PAT address(es) are used up, then the IP address of the mapped interface is used. If you specify ipv6 , then the IPv6 address of the interface is used. For this option, you must configure a specific interface for the mapped_ifc . (You cannot specify interface in transparent mode). DNS—(Optional) The dns keyword translates DNS replies. Be sure DNS inspection is enabled (it is enabled by default). See the “DNS and NAT” section for more information. This section describes how to configure a static NAT rule using network object NAT. For more information, see the “Static NAT” section. If you are creating a new network object, defines the real IP address(es) (IPv4 or IPv6) that you want to translate. Configures static NAT for the object IP addresses. You can only define a single NAT rule for a given object. – An inline IP address. The netmask or range for the mapped network is the same as that of the real network. For example, if the real network is a host, then this address will be a host address. In the case of a range, then the mapped addresses include the same number of addresses as the real range. For example, if the real address is defined as a range from 10.1.1.1 through 10.1.1.6, and you specify 172.20.1.1 as the mapped address, then the mapped range will include 172.20.1.1 through 172.20.1.6. – An existing network object or group (see Step 1). – interface —(Static NAT-with-port-translation only; routed mode) For this option, you must configure a specific interface for the mapped_ifc . If you specify ipv6 , then the IPv6 address of the interface is used. Be sure to also configure the service keyword. Typically, you configure the same number of mapped addresses as real addresses for a one-to-one mapping. You can, however, have a mismatched number of addresses. See the “Static NAT” section. Net-to-net—(Optional) For NAT 46, specify net-to-net to translate the first IPv4 address to the first IPv6 address, the second to the second, and so on. Without this option, the IPv4-embedded method is used. For a one-to-one translation, you must use this keyword. DNS—(Optional) The dns keyword translates DNS replies. Be sure DNS inspection is enabled (it is enabled by default). See the “DNS and NAT” section. This option is not available if you specify the service keyword. Port translation—(Static NAT-with-port-translation only) Specify tcp or udp and the real and mapped ports. You can enter either a port number or a well-known port name (such as ftp ). 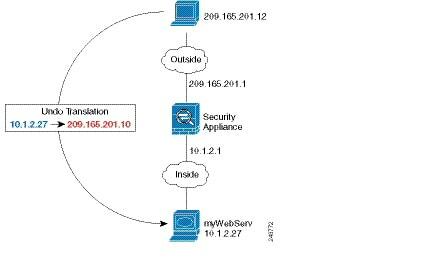 No Proxy ARP—(Optional) Specify no-proxy-arp to disable proxy ARP for incoming packets to the mapped IP addresses. See the “Mapped Addresses and Routing” section for more information. The following example configures static NAT for the real host 10.1.1.1 on the inside to 10.2.2.2 on the outside with DNS rewrite enabled. The following example configures static NAT for the real host 10.1.1.1 on the inside to 10.2.2.2 on the outside using a mapped object. The following example configures static NAT-with-port-translation for 10.1.1.1 at TCP port 21 to the outside interface at port 2121. The following example maps an inside IPv4 network to an outside IPv6 network. The following example maps an inside IPv6 network to an outside IPv6 network. This section describes how to configure an identity NAT rule using network object NAT. For more information, see the “Identity NAT” section. (Optional) Create a network object for the mapped addresses. The object must include the same addresses that you want to translate. See the “Adding Network Objects for Mapped Addresses” section. Configures a network object for which you want to perform identity NAT, or enters object network configuration mode for an existing network object. This network object has a different name from the mapped network object (see Step 1) even though they both contain the same IP addresses. If you are creating a new network object, defines the real IP address(es) (IPv4 or IPv6) to which you want to perform identity NAT. If you configured a network object for the mapped addresses in Step 1, then these addresses must match. Configures identity NAT for the object IP addresses. Note You can only define a single NAT rule for a given object. See the “Additional Guidelines” section. – Network object—Including the same IP address as the real object (see Step 1). – Inline IP address—The netmask or range for the mapped network is the same as that of the real network. For example, if the real network is a host, then this address will be a host address. In the case of a range, then the mapped addresses include the same number of addresses as the real range. For example, if the real address is defined as a range from 10.1.1.1 through 10.1.1.6, and you specify 10.1.1.1 as the mapped address, then the mapped range will include 10.1.1.1 through 10.1.1.6. No Proxy ARP—Specify no-proxy-arp to disable proxy ARP for incoming packets to the mapped IP addresses. See the “Mapped Addresses and Routing” section for more information. Route lookup—(Routed mode only; interface(s) specified) Specify route-lookup to determine the egress interface using a route lookup instead of using the interface specified in the NAT command. See the “Determining the Egress Interface” section for more information. By default, all TCP PAT traffic and all UDP DNS traffic uses per-session PAT. To use multi-session PAT for traffic, you can configure per-session PAT rules: a permit rule uses per-session PAT, and a deny rule uses multi-session PAT. For more information about per-session vs. multi-session PAT, see the “Per-Session PAT vs. Multi-Session PAT” section. Creates a permit or deny rule. This rule is placed above the default rules, but below any other manually-created rules. Be sure to create your rules in the order you want them applied. host ip_address —Specifies an IPv4 host address. ip_address mask —Specifies an IPv4 network address and subnet mask. ipv6-address / prefix-length —Specifies an IPv6 host or network address and prefix. any4 and any6 — any4 specifies only IPv4 traffic; and any6 specifies any6 traffic. The following example performs static NAT for an inside web server. The real address is on a private network, so a public address is required. Static NAT is necessary so hosts can initiate traffic to the web server at a fixed address. (See Figure 4-1). The following example configures dynamic NAT for inside users on a private network when they access the outside. Also, when inside users connect to an outside web server, that web server address is translated to an address that appears to be on the inside network. (See Figure 4-2). 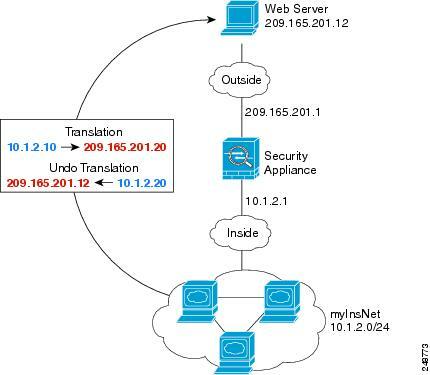 The following example shows an inside load balancer that is translated to multiple IP addresses. 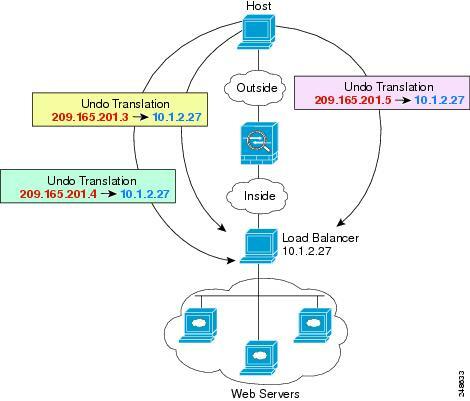 When an outside host accesses one of the mapped IP addresses, it is untranslated to the single load balancer address. Depending on the URL requested, it redirects traffic to the correct web server. (See Figure 4-3). For example, a DNS server is accessible from the outside interface. A server, ftp.cisco.com, is on the inside interface. 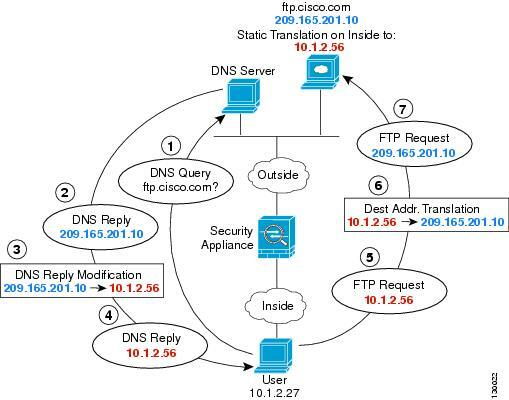 You configure the ASA to statically translate the ftp.cisco.com real address (10.1.3.14) to a mapped address (209.165.201.10) that is visible on the outside network. (See Figure 4-5.) In this case, you want to enable DNS reply modification on this static rule so that inside users who have access to ftp.cisco.com using the real address receive the real address from the DNS server, and not the mapped address. When an inside host sends a DNS request for the address of ftp.cisco.com, the DNS server replies with the mapped address (209.165.201.10). The ASA refers to the static rule for the inside server and translates the address inside the DNS reply to 10.1.3.14. If you do not enable DNS reply modification, then the inside host attempts to send traffic to 209.165.201.10 instead of accessing ftp.cisco.com directly. 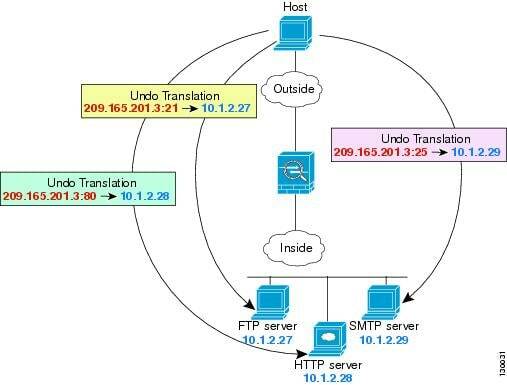 Figure 4-6 shows an FTP server and DNS server on the outside. The ASA has a static translation for the outside server. In this case, when an inside user requests the address for ftp.cisco.com from the DNS server, the DNS server responds with the real address, 209.165.201.10. 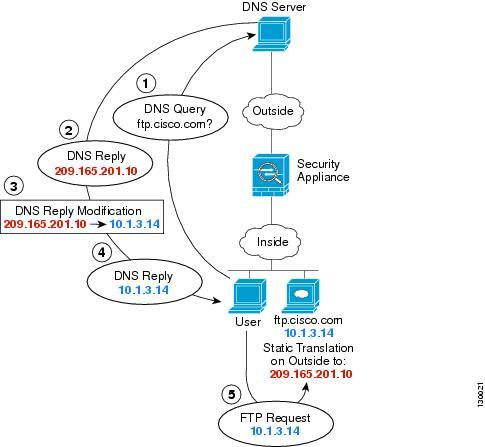 Because you want inside users to use the mapped address for ftp.cisco.com (10.1.2.56) you need to configure DNS reply modification for the static translation. Figure 4-6 shows an FTP server and DNS server on the outside IPv4 network. The ASA has a static translation for the outside server. In this case, when an inside IPv6 user requests the address for ftp.cisco.com from the DNS server, the DNS server responds with the real address, 209.165.200.225. 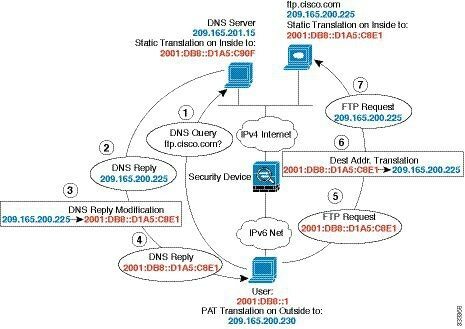 Because you want inside users to use the mapped address for ftp.cisco.com (2001:DB8::D1A5:C8E1) you need to configure DNS reply modification for the static translation. This example also includes a static NAT translation for the DNS server, and a PAT rule for the inside IPv6 hosts. Step 1 Configure static NAT with DNS modification for the FTP server. a. Create a network object for the FTP server address. b. Define the FTP server address, and configure static NAT with DNS modification and, because this is a one-to-one translation, configure the net-to-net method for NAT46. Step 2 Configure NAT for the DNS server. a. Create a network object for the DNS server address. b. Define the DNS server address, and configure static NAT using the net-to-net method. Step 3 Configure an IPv4 PAT pool for translating the inside IPv6 network. Step 4 Configure PAT for the inside IPv6 network. a. Create a network object for the inside IPv6 network. b. Define the IPv6 network address, and configure dynamic NAT using a PAT pool. Table 4-1 lists each feature change and the platform release in which it was implemented. Configures NAT for a network object IP address(es). We introduced or modified the following commands: nat (object network configuration mode), show nat , show xlate , show nat pool . In earlier releases for identity NAT, proxy ARP was disabled, and a route lookup was always used to determine the egress interface. You could not configure these settings. In 8.4(2) and later, the default behavior for identity NAT was changed to match the behavior of other static NAT configurations: proxy ARP is enabled, and the NAT configuration determines the egress interface (if specified) by default. You can leave these settings as is, or you can enable or disable them discretely. Note that you can now also disable proxy ARP for regular static NAT. When upgrading to 8.4(2) from 8.3(1), 8.3(2), and 8.4(1), all identity NAT configurations will now include the no-proxy-arp and route-lookup keywords, to maintain existing functionality. We modified the following command: nat static [ no-proxy-arp ] [ route-lookup ]. You can now specify a pool of PAT addresses instead of a single address. You can also optionally enable round-robin assignment of PAT addresses instead of first using all ports on a PAT address before using the next address in the pool. These features help prevent a large number of connections from a single PAT address from appearing to be part of a DoS attack and makes configuration of large numbers of PAT addresses easy. We modifed the following command: nat dynamic [ pat-pool mapped_object [ round-robin ]]. When using a PAT pool with round robin allocation, if a host has an existing connection, then subsequent connections from that host will use the same PAT IP address if ports are available. This feature is not available in 8.5(1) or 8.6(1). If available, the real source port number is used for the mapped port. However, if the real port is not available, by default the mapped ports are chosen from the same range of ports as the real port number: 0 to 511, 512 to 1023, and 1024 to 65535. Therefore, ports below 1024 have only a small PAT pool. If you have a lot of traffic that uses the lower port ranges, when using a PAT pool, you can now specify a flat range of ports to be used instead of the three unequal-sized tiers: either 1024 to 65535, or 1 to 65535. We modifed the following command: nat dynamic [ pat-pool mapped_object [ flat [ include-reserve ]]]. Each PAT IP address allows up to 65535 ports. If 65535 ports do not provide enough translations, you can now enable extended PAT for a PAT pool. Extended PAT uses 65535 ports per service , as opposed to per IP address, by including the destination address and port in the translation information. We modifed the following command: nat dynamic [ pat-pool mapped_object [ extended ]]. In rare situations, you might want to use a VPN peer’s real IP address on the inside network instead of an assigned local IP address. Normally with VPN, the peer is given an assigned local IP address to access the inside network. However, you might want to translate the local IP address back to the peer’s real public IP address if, for example, your inside servers and network security is based on the peer’s real IP address. You can enable this feature on one interface per tunnel group. Object NAT rules are dynamically added and deleted when the VPN session is established or disconnected. You can view the rules using the show nat command. Only supports Cisco IPsec and AnyConnect Client. Return traffic to the public IP addresses must be routed back to the ASA so the NAT policy and VPN policy can be applied. Does not support load-balancing (because of routing issues). Does not support roaming (public IP changing). We introduced the following command: nat-assigned-to-public-ip interface (tunnel-group general-attributes configuration mode). NAT now supports IPv6 traffic, as well as translating between IPv4 and IPv6. Translating between IPv4 and IPv6 is not supported in transparent mode. We modified the following commands: nat (object network configuration mode), show nat , show nat pool , show xlate . NAT now supports translation of the DNS PTR record for reverse DNS lookups when using IPv4 NAT, IPv6 NAT, and NAT64 with DNS inspection enabled for the NAT rule. By default, all TCP traffic and UDP DNS traffic use a per-session PAT xlate. For traffic that requires multi-session PAT, such as H.323, SIP, or Skinny, you can disable per-session PAT by creating a per-session deny rule. We introduced the following commands: xlate per-session , show nat pool .